It's certainly not the first time fake photos alleged to be parts from upcoming Apple products have surfaced, but a particularly egregious case occurring today is starting to be picked up by other sites, so we thought it would be a good idea to nip this one in the bud. 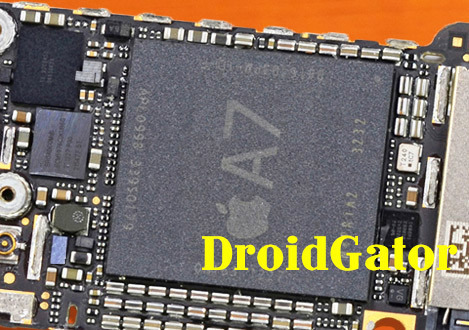 Earlier today, we received a tip about a site sharing photos of what was said to be the iPhone 5S logic board with an A7 chip on it, along with purported specs about this chip. Among the posted photos is a full shot of the logic board, which seems to be 100% identical to the iPhone 5 logic board with the exception of an A7 chip. While there is a decent chance that the iPhone 5 and 5S will have very similar logic boards, there will undoubtedly be some changes and the essentially identical appearance immediately flagged the iPhone 5S photo as a certain fake. Original faked closeup of A7 chip: Notice "3232" date code at right and faint "1227" date code at bottom. 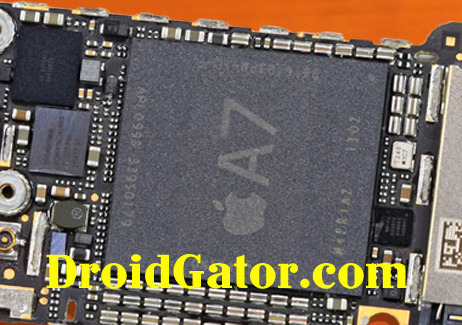 As if that evidence were not enough, the post provides additional information in the form of a closeup of the A7 chip, showing off unique part numbers and other codes not seen on the A6 chip in the iPhone 5. These codes also immediately gave away the photo as a fake, and we replied to our email tipster to point out the issue. It's a fake. The numbers shown on that A7 chip are inconsistent and in some cases nonsensical. For example, there is a "3232" along the right side of the chip. This number should be a code noting the two-digit year and two-digit week of manufacture. Since we're not currently in the year 2032, this code is clearly fake. In a similar vein, there is another faint manufacture date code along the bottom side of the chip for a different component within the chip. This one they failed to Photoshop, so it shows a "1227" code indicating that it was made in mid-2012 as was the case for the A6 in some early iPhone 5 devices. We suspect our tipster was associated with the fake photos, as the closeup image was quickly replaced with a new one changing the "3232" to a more sensical "1302" corresponding to the second week of January 2013. The site's watermark on the image was also moved to obscure the second "1227" date code. Replacement faked closeup of A7 chip: Notice new "1302" date code right and watermark moved to obscure code at bottom. We had hesitated to post about these fake photos, but with at least half a dozen other sites having already picked up on the story with varying levels of skepticism, we thought it most important to set the record straight. Since we're not currently in the year 2032, this code is clearly fake. ...half-hearted attempt(s) to fool a bunch of nerds who vehemently study and know every millimeter of electronics' components are futile! This gave me some interesting insight into what those numbers actually mean. Thanks for setting things straight! I'd think you'd have taken the higher ground and kept this story off site...? We've tried that in the past...they just end getting even more visibility from people who don't realize they're fake. Better it be made clear they're fake than have more people taken in by the hoaxes. I wish you had posted their "fake" specs. I was curious, I didn't want to give them a page view but on the other hand I wanted to see what crap they made up. Who has time to waste on doctoring a photo? Why? "Fortune and glory"? ?